KRION™ at Joselito's, the elegant Bistro with the "The World’s Best Ham"
Joselito's group has two establishments in Madrid, on Narvaez Street and on Velázquez Street, the latter premises decorated with KRION™, PORCELANOSA Group’s solid surface. 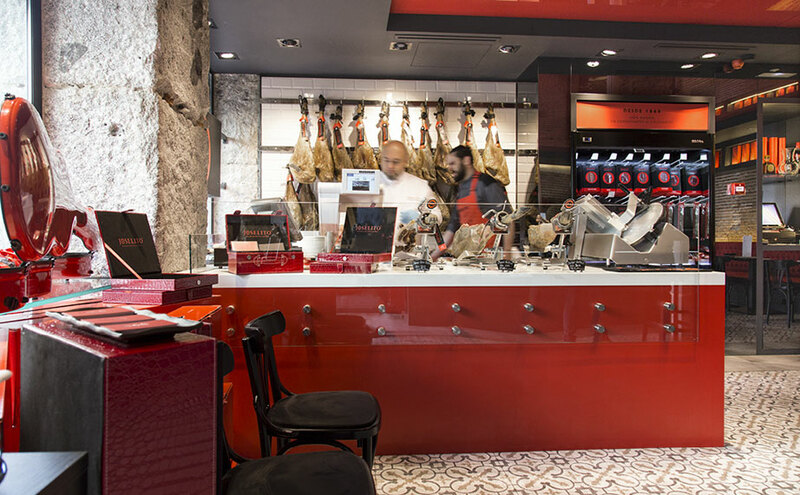 Joselito'sonVelazquez is part of the Joselito Company, whose flagship product is known worldwide and has been labelled "The World’s Best Ham"; this Bistro, designed by Julio Touza Architects, offers high quality Joselito Iberian products and a seasonal selection. KRION™ can be found inside the establishment, on countertops at the haute cuisine deli store, in 1100 Snow White, which emphasizes the brand’s elegant corporate red and perfectly matches the vintage and contemporary style of the establishment. KRION™’s star piece can be found in the cellar located in the basement of the premises, an old coal cellar with exposed brickwork, which boasts a spectacular table transformed by Sequoia Design, used as a private room for events and wine and ham tastings. The common feature shared by Joselito Hams and KRION™, is their every care for the raw materials, though diametrically opposed, the goal is the same, i.e., the pursuit of excellence. Joselito has achieved this thanks to the 100% natural curing process, a century of experience and tradition, while KRION™ is taking its first steps to also become a benchmark Brand in the Solid Surface market. As stated on their website: "Joselito is a gastronomic gem, a legend rather than a brand".